Grafton Pond is a 300+ acre lake with an almost entirely undeveloped shoreline. There are numerous bays and uninhabited islands to explore, offering excellent swimming, fishing, and wildlife-watching opportunities. A state-owned boat launch near the parking area offers the best spot for putting in your canoe or kayak (gas powered motorboats are not permitted) to begin exploring. Loons often nest on this pond in spring and summer, so be sure to keep your distance from any nests and/or parents with young loons. No closer than 300’ is the recommended distance to be sure you are not harassing this threatened bird species. Moose have also been spotted enjoying the pond on quiet mornings. Pack a lunch and paddle out to enjoy it on one of the numerous flat rocks along the pristine shoreline. Grafton Pond can be very busy on summer weekends, so you may want to try an early weekday morning for the sublimely peaceful experience that this wild pond can deliver. If you don’t have a canoe or kayak, there is also a short hike out to a point on the pond’s shore that begins about 500’ south of the parking area. If you enjoy Grafton Pond and are interested in making sure that it stays as pristine as possible, consider joining the Friends of Grafton Pond’s email listserv from the groups blog. This group of neighbors and stakeholders is active in providing visitor outreach, maintaining recreational infrastructure, and monitoring the pond environment to ensure it remains forever wild. This is one of the Forest Society’s larger reservations, and thanks to the donors and other local conservationists, most of the pond frontage is protected. Launch your canoe or kayak at the public landing, and explore the bays and islands. This is warm-water fish habitat, and you’ll enjoy casting for bass and other warm water species around the rocks and fallen trees. Loons nest here, and rarely does one go to Grafton Pond during the summer without seeing or hearing these spectacular birds. Mascoma Savings Bank Foundation provides generous financial support for the Forest Society’s stewardship efforts at Grafton Pond. The Forest Society is also grateful to volunteers from Hypertherm who help care for the reservation. This trail is short (about 0.3 mi, one way) but lovely, with an old stone wall to the north and a variety of young trees throughout. On the ground, fresh moose and deer tracks can often be found. The trail ends at a point on Grafton Pond’s shoreline, where the pond's islands can be seen, along with a stunning view of Mount Cardigan. From the parking lot adjacent to the Grafton Pond Dam, walk south on Grafton Pond Road for about 500’. A trailhead is on the left, marked by a green metal gate. This generous gift of land ensures the permanent protection of one of the state’s largest mostly undeveloped lakes (234 acres). This reservation surrounding Grafton Pond was the gift of an anonymous donor who wanted to preserve the wilderness pond and its seven miles of shoreline as one of the remaining sanctuaries for nesting loons. An advisory committee was formed that year to raise funds to create an endowment for the management of the property and to offer advice on land use and initial programs. The Forest Society’s emphasis is on preserving important natural areas, improving commercial timber stands, and enhancing wildlife habitat. 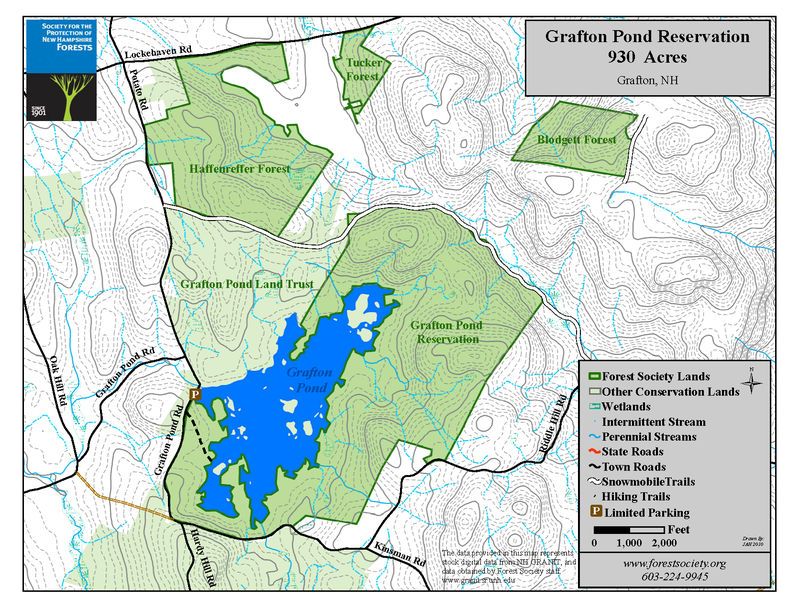 The Forest Society’s ongoing challenge is to manage the land to conserve and enhance the outstanding recreational and scenic resources of Grafton Pond. The dramatic floodplain landscape includes oxbows, back channels, and high terraces that host a dynamic collection of overlapping natural communities.